Last year Samara Private Game Reserve in South Africa joined Pack for a Purpose to give their guests the opportunity to provide donations for their three community-based projects. After only six weeks on the PfaP website, Samara reported its first donation, which was earmarked for the Marjery Parkes TB Hospital in Graaff-Reinet. This generous donation, made by Julie S. from America, included stuffed toys, toothbrushes, toothpaste and Band-Aids, as well as children’s books and various toys. Jenny from Samara delivered the supplies to the hospital where the young patients were especially overjoyed to receive such wonderful cuddly toys. She had the pleasure of experiencing firsthand what a powerful impact a PfaP traveler can have. The little girl in pink is Kelly Grootboom, who we are told was half dead when she was admitted. This child is the most darling little girl who is six years old and absolutely bursting with personality. 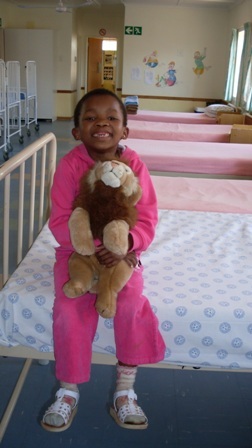 She originally took a teddy bear, but when she spotted the lion, her face just lit up and she swapped. He was immediately named Simba. One little boy was a little old for stuffed toys and when I last saw him, he was proudly clutching one of the books, a toothbrush and toothpaste with a big grin on his face. PfaP is thrilled to have provided the opportunity through our website to make this generous donation of supplies a reality.